"Love is a lesson learnt the hard way." 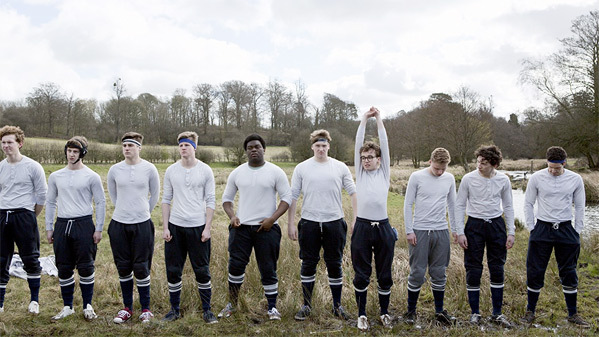 Film4 in the UK has debuted an official trailer for an indie coming-of-age comedy titled Old Boys, from newcomer director Toby MacDonald. The film is another new updated adaptation of the classic play Cyrano de Bergerac, about a guy who tries to setup his friend with a girl. This film is set at a British boarding school and is about an awkward kid who helps setup the "school-hero" with the daughter of a visiting French teacher. Old Boys stars the talented Alex Lawther (from Freak Show, Ghost Stories, The Imitation Game) as well as Pauline Etienne, Jonah Hauer-King, Joshua McGuire, Denis Menochet, and Nicholas Rowe. This looks amusing and cute, perhaps worth a watch sometime. In this school-set re-working of Edmond Rostand's play Cyrano de Bergerac, an awkward but imaginative pupil helps the handsome but spectacularly dim school-hero pursue the fiery daughter of a visiting French teacher. Old Boys is directed by British filmmaker Toby MacDonald, making his feature directorial debut after a few short films and other work previously, including episodes of "My Life in Film". The screenplay is written by Luke Ponte and Freddy Syborn, based on the play Cyrano written by Edmond Rostand in 1897. The film is set to premiere at the Edinburgh Film Festival later this summer. For more info, visit the official website. No other official release dates have been set for this yet - stay tuned. First impression? Thoughts?